BRUSSELS (AP) — Belgian authorities announced Monday that the number of victims from last week's airport and subway suicide bombings rose to 35 and three more people swept up in police raids were being held on charges of participating in terrorist activities. It was not clear if the three suspects ordered held by an investigating magistrate were linked to the March 22 attacks in Brussels that killed 35 people and wounded some 270. Those suspects — identified by Belgian prosecutors as Yassine A., Mohamed B. and Aboubaker O. — were detained during 13 police searches Sunday in Brussels and the northern cities of Mechelen and Duffel. 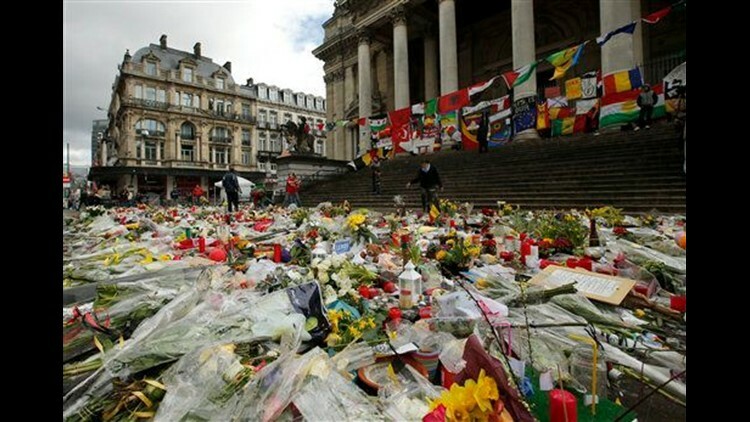 The Belgian Federal Prosecutors Office provided no details of the alleged actions committed by the suspects and said a fourth person also detained Sunday was released without charge. The bombings, the bloodiest tragedy in recent Belgian history, were claimed by the Islamic State group and confirmed Belgium's status as an unwitting rear base from which Muslim extremists can stage attacks. Many of those responsible for the Nov. 13 attacks in Paris that killed 130 and wounded hundreds came from Belgium. On Monday, Belgian Health Minister Maggie De Block announced on her Twitter account that four of those hospitalized after the bombings at the Brussels Airport and in a city subway train had died of their injuries. De Block reported over the weekend that 101 of those wounded in the blasts were still being treated in hospitals, including 32 in burn units. A doctor at one of those burn units who had once served in Afghanistan described patients' wounds as shocking. Authorities have said a man identified as Faycal C. is among those in custody and has been charged with terror offenses. Belgian media had claimed the man was Faycal Cheffou and said he was the mysterious suspect in the white jacket and dark hat seen with the suicide bombers at Brussels Airport before the attacks Tuesday morning. Police at the time would not comment on those reports. But on Monday, the Belgian Federal Police's website showed a short video of that same airport suspect as he wheels baggage through the airport along with the two bombers. "Police are seeking to identify this man," the website says. Belgian police did explain why they had released the video now. One week after the devastating attacks, Brussels Airport is planning to test its capacity to partially resume passenger service, but it's too early to say when service might actually resume, an airport official said Monday. The attack severely damaged the airport's departure area. Florence Muls, an airport communications manager, said 800 staff members on Tuesday will test temporary infrastructure and new arrangements designed for passenger check-ins. The Belgian government and firefighters must approve the new system before Brussels Airport can start handling passenger traffic again, she said.